Now that the FDA has received at least a temporary reprieve from the longest government shutdown in history, we thought we would share some background and a timeline, along with our experience during the shutdown. Most months, Camargo meets with the FDA at least 4 times to discuss various Sponsor development plans for drugs and combination products. In addition, we submit INDs and NDAs to most Divisions at the FDA’s Center for Drug Evaluation and Research (CDER) so we are among the first to feel the effects of a government shutdown on the FDA. In the following timeline, note that ‘Gottlieb’ refers to the FDA Commissioner, Scott Gottleib, MD; ‘NDA’ = New Drug Application; ‘BLA’ = Biologics License Application; ‘OTC’ = over-the counter; and ‘PDUFA’ = Prescription Drug User Fee Act funding for new drug applications. During the shutdown, and likely as a result of curtailed activities during the shutdown, much of the communications and clarifications about the FDA’s activities were in the form of tweets from Commissioner Gottlieb. These can be retrieved from https://twitter.com/SGottliebFDA. Other links are embedded in the text below. Continuing resolution including approximately $5 billion for a new border wall did not reach the signing stage. 41% of the FDA’s 17,000 employees furloughed. An announcement on the FDA’s website indicates that the FDA can no longer accept user fees for new applications for marketing approval until an appropriations bill or Continuing Resolution for funding year 2019 for the FDA is enacted. Thus, no applications requiring a user fee, i.e., initial NDA and ANDA applications can be filed. Gottlieb tweets that the FDA will use carryover user fees from 2018 to continue to conduct pre-approval discussions with sponsors, and to develop some (but not all) guidances. Carryover funding cannot be used to support development of OTC monograph products (for OTC NDA products see NDA products in the next tweet). Work on biologics regulated solely under Section 361 of the Public Health Service Act cannot be conducted with carryover user fee funding. Exceptions include life-saving activities such as adverse event surveillance and product recalls. Gottlieb also tweets that during the shutdown, the FDA can only accept new PDUFA regulatory submissions that do not require a fee. This includes INDs, and exempt NDAs (eg. orphan designated products, small business waiver). PDUFA-covered products include 505(b)(1) and 505(b)(2) NDA applications (new and ‘repurposed’ drugs), and 351(a) BLA applications (biologics). Non-exempt NDAs/BLAs cannot be accepted during the shutdown. Gottlieb warns that carryover PDUFA funding from 2018 for new drugs is likely to run out in 1 month. User Fee funding for medical devices expected to last 2 -3 months. Gottlieb tweets that device safety work is being prioritized for pre- and post-market medical devices. This includes monitoring adverse events, processing, reviewing and classifying new devices. Gottlieb tweets that the lapse in funding represents one of the most significant operational challenges in FDA’s recent history. Additional activities were added to those considered ‘excepted’ during a shutdown including ‘expanded inspection activities beyond “for-cause” inspections to also include foreign and domestic food, drug, medical, device and pharmacy compounding surveillance inspections focused on the highest risk products and facilities”. Gottlieb tweets that 400 inspectors have been recalled from furlough ‘to re-initiate high risk surveillance inspections across our food and medical product programs.’ This includes about 100 staff focused on inspections of high risk medical device manufacturing facilities; about 70 staff focused on inspections of high risk drug manufacturing facilities; and about 90 staff focused on inspections of high risk biological manufacturing facilities. Continuing Resolution funded. US government reopened for 3 weeks. FDA employees return to work. 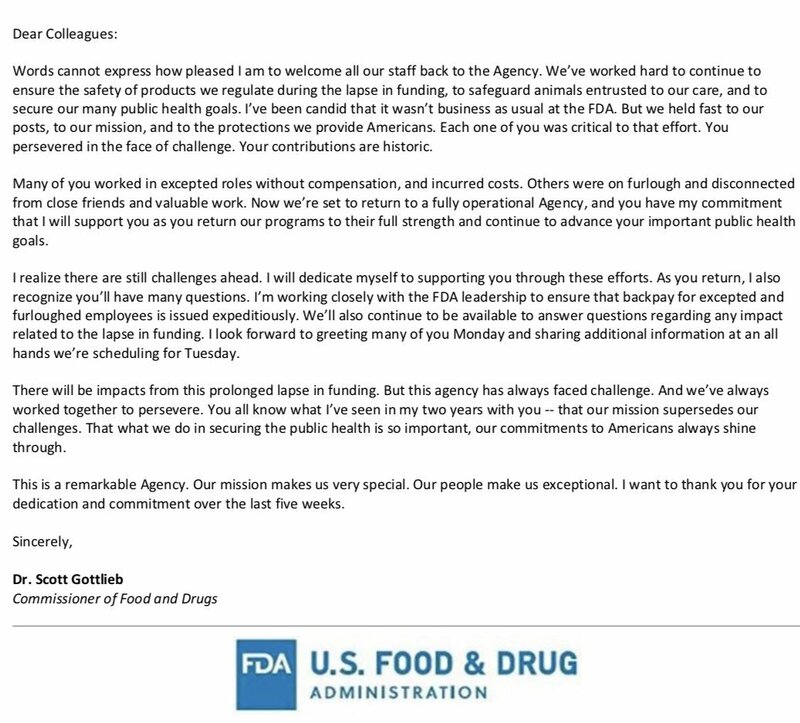 In a memo to FDA staff, Gottlieb recognized the contributions of furloughed and excepted employees, and notes that ‘there will be impacts from this prolonged lapse in funding’ but that ‘our mission supersedes our challenges’. Gottlieb welcomes back all employees in an all-hands meeting at the FDA. He thanks staff for their dedication and fortitude during the shutdown. As mentioned in the timeline, submission of any marketing application requiring a fee was not possible during the shutdown. This meant a delay initiating the drug review process for as long as the 5 weeks that the shutdown lasted. The subsequent delay in approvals will be significant for some Sponsors. After all, consider the multi-million dollar price tag applied to priority review vouchers that shorten review times by 3 months. Of lesser impact, work on preparing some but not all guidance documents was put on hold until after the shutdown. Also, while official notification of the availability of some documents was delayed from publication in the Federal Register, the FDA posted notices on their website. The notice explained that when the Federal Register is available, a notice detailing how to submit comments on the documents would be included. Interestingly, all of the meetings that Camargo had scheduled with the FDA during the shutdown took place. The meeting requests had all been granted prior to the shutdown, and the FDA endeavored to fulfill their commitment to prepare for and attend the meetings. Fortunately, the Continuing Resolution was enacted just before the 2018 PDUFA funding ran out. Without the Continuing Resolution, it is likely that future scheduled meeting would be delayed. As the Continuing Resolution only ends the shutdown for three weeks, uncertainty and potential delays in the drug review and approval process are still a great concern. If you would like to take advantage of Camargo’s up-to-date information based on our frequent interactions with the FDA, contact us to discuss the best path forward for your product. Our regulatory, CMC, pharmacokinetic, clinical, and nonclinical experts are here to help.